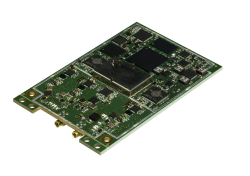 DataGrid, Inc. has released the third generation of its programmable DGRx-GNSS receiver for OEM integrators as well as a high-sensitivity mode for DGRx-GNSS that allows the receiver to track the L1 and L2C codes transmitted by GPS and GLONASS satellites down to a signal level of only 15 dB-Hz. The Gainesville, Florida-based company develops custom and off-the-shelf small GPS/GNSS systems for cadastral surveying, land administration, and GIS applications. The new DGRx gives integrators the option to support new signals as they emerge and to program their DGRx with custom features that differentiates their end-user product from all others. The DGRx is also available as a finished RTK receiver with highly competitive performance and options selected from DataGrid’s off-the-shelf firmware. DGRx-GNSS V3.0 is expected to be available in production quantitites in the first quarter of 2010.